Sure, it’s easy to pick up a jar of applesauce at the store. Or those little single-serve containers. Mott’s, Musselman’s, your local store brand…there are plenty of choices. There are lots of varieties as well…chunky, sweetened, unsweetened, berry-flavored, cinnamon, and the list goes on. Unfortunately, unless you are very careful and very selective, you will probably end up with a processed product that contains one or more of the following: high amounts of added sugar (including possibly high fructose corn syrup), non-organic apples, and preservatives. So what’s a health-conscious person to do? Easy peasy…make your own applesauce! There are lots of great recipes out there (see the list below for a few to start you off). While they may vary in method and ingredients, there are certain elements that are necessary for producing consistently awesome applesauce. A.k.a. “awesomesauce”. Get it? Hehe! Apples are number 1 on the Environmental Working Group’s Dirty Dozen list of the most pesticide-laden fruits and vegetables! For this reason, be sure to choose organic apples. In general, “softer” varieties of apple are better for sauce. Consider trying Jonathan, Jonagold, Gala, Pippin, or McIntosh. Try using multiple varieties for sauce with a complex flavor. I use filtered water for my cooking liquid, but apple juice or cider will work as well, and will enhance the apple flavor of your sauce. Just pay attention to the type of juice or cider you buy…you don’t want to ruin wonderful organic apples with non-organic cooking liquid! Also, juice and cider are heavy on the sugar, so if you use them, cut back or eliminate other sweeteners. Cinnamon is a natural for enhancing the flavor of apples while they are cooking. But did you know that cloves, nutmeg, and even a little allspice can really kick your sauce up a notch in the flavor department? Lemon rind too — peel strips from a washed lemon, taking care that none of the white pith is included. For easy removal after cooking, wrap your spices (cinnamon sticks, whole cloves, whole allspice berries, lemon peel) in a double thickness of cheesecloth and tie it closed with a piece of twine. Trust me, you don’t want to be picking tiny cloves or allspice berries out of a pot of cooked apples one at a time. You don’t have to sweeten your applesauce at all. If you enjoy it on the sweeter side, however, I recommend using organic brown sugar. Don’t limit yourself, however; feel free to try honey, agave, or unrefined sugar as well. Make sure you use a pot large enough to comfortably hold your cut-up apples, liquid, and spice bundle. I use my Vitamix. It can accommodate all of my cooked apples at once (when I make a batch I generally use 16 small-to-medium apples). It is fast — just a few seconds. And best of all, it is so powerful that my applesauce comes out silky smooth with a baby-food consistency. None of that chunky stuff for me, thank you! You can also use a regular blender. Be aware that you may not be able to process all of your apples at once, but that’s okay. Just take your time and you’ll be rewarded in the end! If you’re not a blender-type person, or if you prefer super-chunky sauce, use a potato masher. Just be sure your apples are very well-cooked and soft. Also, if you aren’t one to peel your apples before cooking (I always peel), a potato masher will probably not break up the peels as well as a blender. 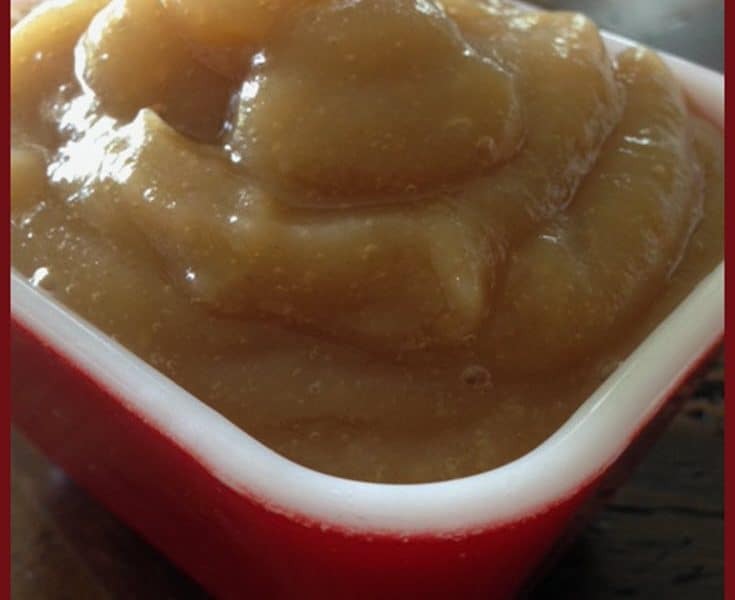 This wonderful Applesauce recipe from Simply Recipes is what I use, but with a few tweaks. For starters, I do add about a teaspoon of whole cloves along with the cinnamon, and I use the cheesecloth method mentioned above to keep the spices and lemon peel together in the pot. Second, I find that when the apples are finished cooking, there is a lot of liquid in the pot; adding that to the cooked apples during the blending process results in kind of a thick apple water, so I remove the apples with a slotted spoon and discard the cooking liquid. Third, instead of white sugar, I use organic light brown. And lastly, I make the peeling, coring, slicing process super-easy by using this Apple Peeler, Slicer, & Corer .